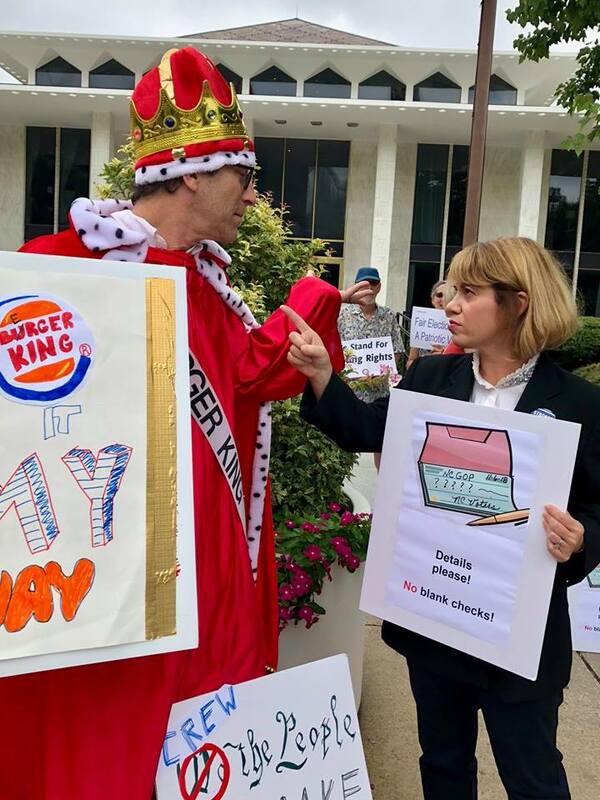 North Carolinians Want Independence from Berger King! Tell Berger King to Stop the Dirty Tricks! Berger King – Have It MY Way! Screw The People, I Make The Rules! This Berger Is OverDone. Time to Flip Him! Tell Us What We’re Voting For – No Pig In A Poke! Protect Our NC Constitution – Vote Against Every Amendment! Just Say No. Don’t Override The Veto. Details Please. No Blank Checks. One of our chants pointed out that the current GOP supermajority in the state legislature was elected through gerrymandered districts that have since been ruled unconstitutional. Another chant we made on the fly. Not only did the NCGA leaders make these unnecessary and some very dangerous Constitutional Amendments, they called a special session with less than 24 hours notice to change the rules on setting captions because they apparently feared honest and helpful captions. There is already a commission to set the captions on the constitutional amendments. One bill takes away the job of that commission and gives it to legislative leaders. But it is not the legislative leaders’ job to have. To solve the problem of pesky informative captions, leading lawmakers decided the captions should say “Constitutional Amendment”! All 6 of them. That is all! Lawmakers should leave the veto. The second bill manipulates the NC Supreme Court election and other judicial elections yet again. 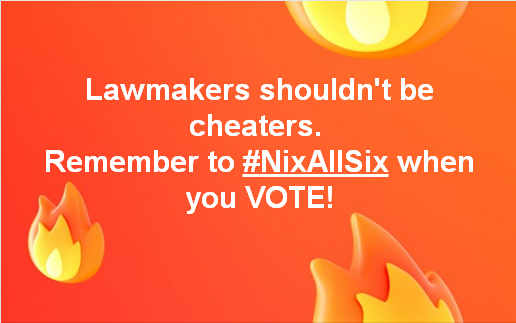 These are elections the #NCGA already interfered with by making all judicial races partisan races and by eliminating primary elections in them. There was also a new law passed, mid-campaign, to put candidate Anita Earls last on the ballot. The latest bill targets a candidate in the same NC Supreme Court race, by removing the partisan tag off a third candidate in this race and only him. Lawmakers should vote against this election interference by letting Governor Cooper’s vetoes stand. The targetted judicial candidate in this judicial race was present at the Legislative Building as well, and said in an interview that he plans to file suit on Monday, 8/6/18. People say that the reason for the rare Saturday override session was to further limit time for the expected lawsuit or lawsuits to go forward. As serious as this legislative interference into the election is, protesters still found time to makes points with humor. 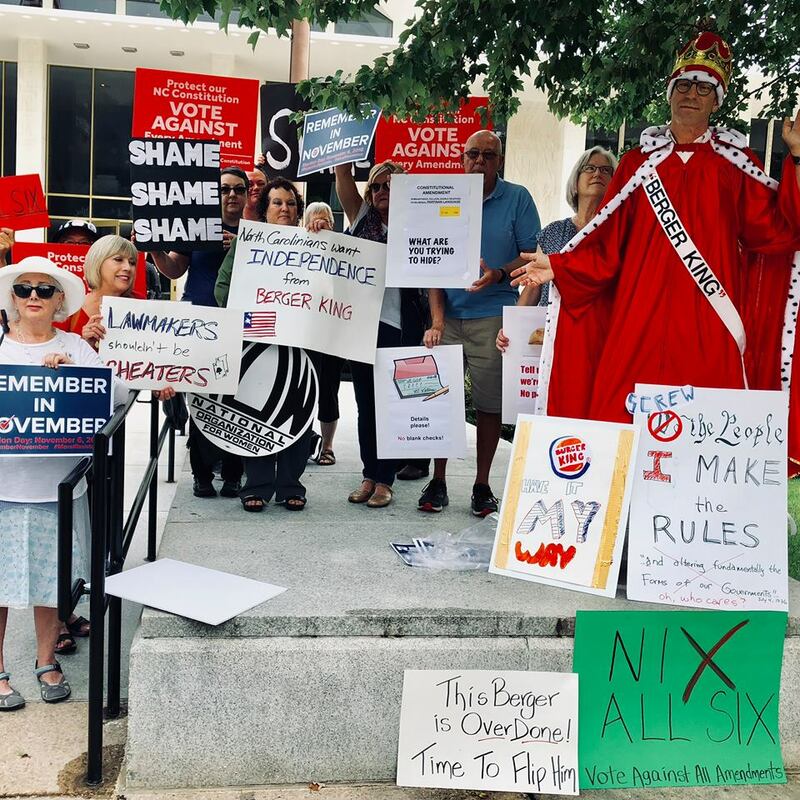 Writer Scott Huler dressed as “Berger King held a sign that said “Screw the people, I make the rules,” When the crowd chanted, Huler interjected with comments that would come from a very clueless ruler, and really played the part with panache. In a serious moment, Huler pointed out that Republicans only have as much power as they do in the General Assembly because of gerrymandering and shameless power grabs. Then we went in to the Legislative Building and through security. 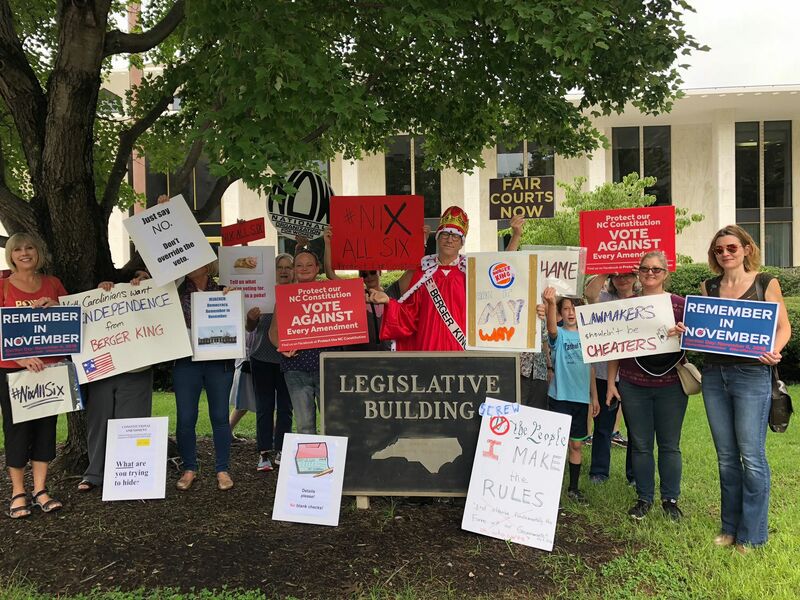 The NC House started first – so many people were outside the gallery window with signs. Then we went to the Senate Gallery with our signs. Then back to the House. Then back to the Senate. 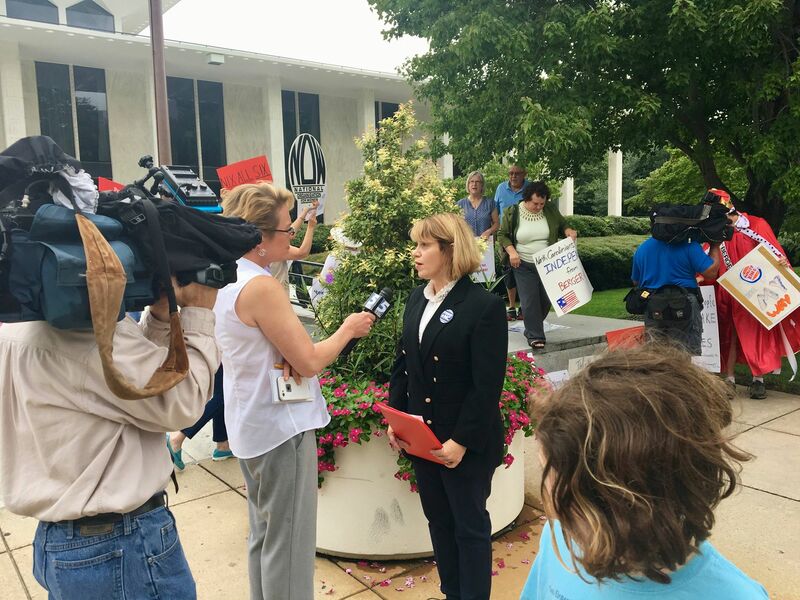 This coverage shows comments from both sides at NCGA, protesters chanting, and Judicial Candidate Chris Anglin speaking out about his plans to sue after latest legislative attack on him in the NC Supreme Court race. See “NC General Assembly overrides 2 Cooper vetoes,” 8/4/18, CBS-17. Excellent news! Current action on one of three lawsuits after the Saturday session. Party switch angered GOP leaders – well too bad. “Judge prevents finalizing North Carolina ballots for now,” 8/6/18, ABC-11. This entry was posted in Judicial takeover, ncga interference, protest, veto and tagged Judicial takeover, ncga interference, protest, veto. Bookmark the permalink.